Goodreads says, "In Philadelphia, good girl Kate is dumped by her fiance the day she learns she is pregnant with his child. In New York City, beautiful stay-at-home mom Vanessa is obsessively searching the Internet for news of an old flame. And in San Francisco, Dani, the aspiring writer who can't seem to put down a book--or a cocktail--long enough to open her laptop, has just been fired...again. In an effort to regroup, Kate, Vanessa, and Dani retreat to the New Jersey beach town where they once spent their summers. 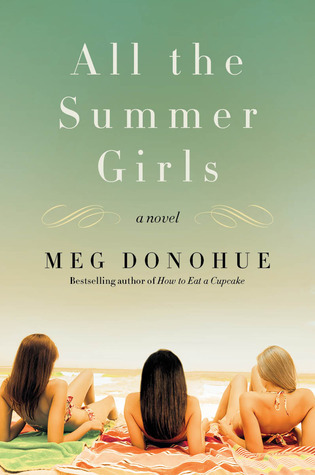 Emboldened by the seductive cadences of the shore, the women being to realize how much their lives, and friendships, have been shaped by the choices they made one fateful night on the beach eight years earlier--and the secrets that only now threaten to surface." I live outside Philadelphia and go to the Jersey Shore every year (not to be confused with Snooki's Jersey Shore), so obviously All the Summer Girls is one of my most anticipated reads of the summer. I love the sound of this one and hopefully it captures what I love most about my favorite beach towns. Let me know what you think! I have heard that How to Eat a Cupcake is really good, so I will have to check it out. Thanks for dropping by, Christina! OOh! This one looks good! Hope you enjoy it! This one kinda has the sound of a sisterhood of the traveling pants book! I think it could be really cute! Oh, this sounds exactly like the kind of thing I would enjoy. Thanks for highlighting it! This sounds really good! Happy Reading! O sounds good. I like the little swirls on the cover too. Lovin the cover, sounds like fun too!